What Size Generator Do I Need For a Travel Trailer? Now that you have gotten your travel trailer, are you prepared for your first trip to enjoy the great outdoors? One of the first things we purchased for our travel trailer was the generator since we will not always be parked in an RV campground. We found out on our very first trip that our generator didn’t even have enough power to run the coffee maker. We are here to help make sure that you have the right generator for your needs! So, what size generator do you need for a travel trailer? You need enough wattage to run your AC unit plus an additional 600 to 1000 watts for a total of 3000 to 4000W. There are a couple of things to consider when looking for generators. Will you be mainly “dry” camping, being completely off-grid? Or will you be “glamping” and parking at an RV park for all of your travels? 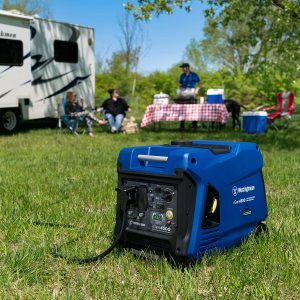 If you plan on doing most of your camping without being hooked up to electric and water, “dry camping,” you need to make sure that you get a generator that is powerful enough to run everything that you want to run. If you are mainly “glamping,” setting up in an RV park, you will probably only need a small generator for those just in case instances. So let’s break it down for you a little bit more. How Much Power Do I Need? | How Many Watts Do I Need? You have the travel trailer, and you are shopping for a portable generator to power your air conditioner, furnace, and your big and small kitchen appliances. The obvious question is: How big of a generator do I need for my travel trailer? Unfortunately, that question is determined by another: How big of a generator do I need to run my travel trailer’s air conditioner? Your air conditioner will be taking the most wattage by far, so you need to start here. You also need to know that it takes more power to start the air conditioner than it does to keep it running. The minimum wattage of the generator you need is equal to the starting wattage of your air conditioner. Do you need to run a space heater (1500 watts), maybe keep your beverages cold in the fridge (600 watts), and listen to the radio (50 to 200 watts) while sitting around the table? Maybe all you need is your coffee in the morning– so that 600-watt coffee maker needs to be in working condition. Laptop (250 watts), charge your smartphone (4 watts), and lights whose light bulbs have the wattage written on them also consume more wattage. There is so much that you need to consider so that you purchase the right generator and you don’t have the same problem we did. At this point, you also need to know that most generators have a starting watts and running watts rating. So a 3000W generator might give you up to 3000W to start that air conditioner, but for long term use might only be rated 2600W. So after your 3000W generator starts your 13,500 BTU air conditioner which might run at 2000W, you have around 600W to use on other items. You might watch TV with your satellite receiver, or start your slow cooker while listening to the radio. So you need to be mindful of your trailer and how much power is required to run certain things. What Generator Fuel is Best – Gas or Propane? There is no right or wrong answer when it comes to picking between a gas or propane generator. We are going to share with you the pros and cons for both gas and propane powered generators. Pros: Gas is a common fuel source and can be found and accessed easily. The gas-powered generators are also very portable. Depending on the size you get, some will have wheels on them so you that you don’t have to carry them. Gas-powered generators are more efficient than propane-powered generators. Cons: Gas is highly flammable, so you need to be careful how you store it and travel with it. Gas only has a shelf life of about 12 months and does not burn clean like propane. Pros: Propane has a long shelf life, so if you don’t use it all up this summer, you can use it next summer and not have to worry about it losing its mojo. Propane burns clean and is easily stored in cylinders. Propane generators are also quieter than gas-powered generators and are more emissions compliant. Cons: Propane powered generators don’t quite run at full capacity. Therefore you should shoot for a generator with a slightly higher output than you calculate you will need. This may mean that buying a larger generator could cost a few extra dollarsHow Much Fuel Does A Portable Generator Use? It all comes down to how many hours of runtime can you get out of your generator when it’s powered by a gallon of fuel – this is your starting point in determining gas consumption. You don’t want to spend half of your time refilling the generator, so make sure you realize how much run time you can get out of your generator before going off the grid. The good news is there are a lot of reliable fuel consumption calculators available online – these can help you get an estimated number quite easily. But before you turn to an online calculator, read the product information provided by the manufacturer. You will find more accurate numbers when it comes to fuel consumption since manufacturers have charts that include all the variables needed for a more precise estimation. To make sure you’ll have enough fuel for your weekend away and unplugged, imagine the worst case scenario, a situation where you’ll need to have the generator running continuously for 24 hours on full capacity, and plan accordingly. 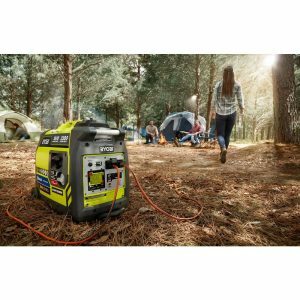 What are the Best Brands of Portable Generators? Now that you have decided if you want a gas or propane-powered generator let’s talk about the best brands of portable generators for your travel trailer. No matter which brand you choose, make sure you get a generator with a remote start feature. You will be glad you did when you don’t have to run outside first thing on a chilly morning to fire up the generator to start the coffee maker! There are so many to chose from, but in my research, I have found that the Westinghouse iGen4500 is the one that I like the best. If you are looking for a smaller generator, I would suggest the Ryobi RYI2300BTA – 2,300 watt Bluetooth generator. How Much Does A Portable Generator Cost? When it comes to portable generators, the prices can vary immensely! The Ryobi that is listed above ranges from $550 – $620 depending on when are where you buy it from. The Westinghouse iGen4500 $950 to $1400, again depending on when are where you buy it from. When it comes to generators, you get what you pay for. If you are looking to save a few bucks and go with a lesser model, the components on the inside may not last as long as a more expensive one. Not to mention, the less expensive ones will not be as quiet as the others either. Do I Really Need a Generator for My Travel Trailer? I can imagine some of you camping enthusiasts out there shaking your heads at the mention of generators. While I would generally agree with you, wouldn’t you rather be safe than sorry? Keeping your phone charged for safety reasons. Lighting up the campsite in the evening. Enjoying some music while playing games, eating dinner, or just for some background noise while you are sitting around chatting with your friends and family. With all that I’ve shared with you, I’m sure you’re well aware there are a lot of factors that come into play when determining what size generator you want to get for your travel trailer, what brand you should get, what kind of fuel you want to use, and how much the generator and fuel will cost you. We would love to get some feedback from our readers, so please leave your thoughts or suggestions in the comments section below. Thanks for reading this article and if you would like to email me directly, please visit our Contact Page to send me an email. Great article. Very clearly laid out. Love the pros and cons. My wife and I are newbies and discovered the value of a generator our third night out unexpectedly in a parking lot for three days. Won’t leave home without one again. What do you know about solar generators?